The Accessory units (AC-___) are counter top extenders that can attach to all YT Base units. These units provide additional counter top areas to be used for food preparation or eating counters. They can add specialized utility to a workstation because they can be ordered in a different surface material than the main unit. For example, attaching a granite AC-29SIDE to an unfitted Sink Workstation that has a wood worktop creates and area on which to rest hot cooking vessels that have come directly from the cooktop or oven. 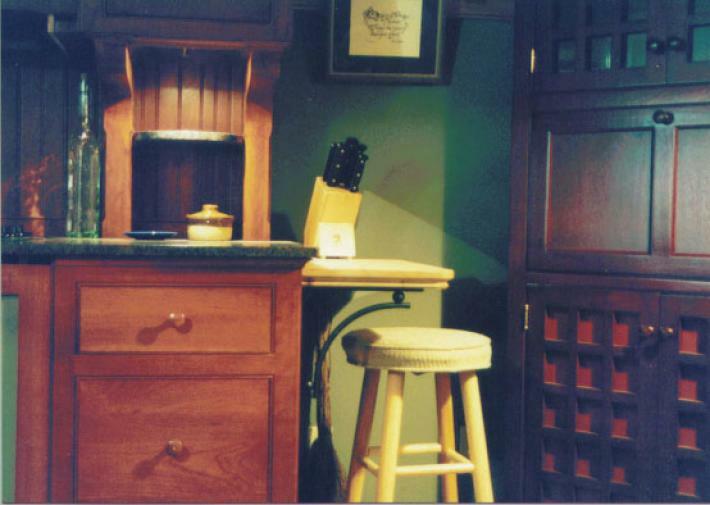 Conversely, attaching a Butcher Block AC-29SIDE counter top extension (as shown here) to a granite topped freestanding Range or Sink Workstation yields a very handy chopping surface close by for these food preparation units. The space under these units can accommodate a stool that can be used for sit down cooking operations, or even a pot or wine rack. The AC units can be mounted at any height, which makes them quite suitable for sit down eating counters or children’s food prep areas. The AC units that attach to the back side of Island Base units can be used as shelving, more worktop space or as large eating areas. Shown above is a AC29 x 12, 12″ wide x 29″ deep, typically mounted 2″ below the adjacent counter top, includes 2 iron brackets and a butcher block top. Next ArticleAmazing Ready-Built Workstations on Sale!